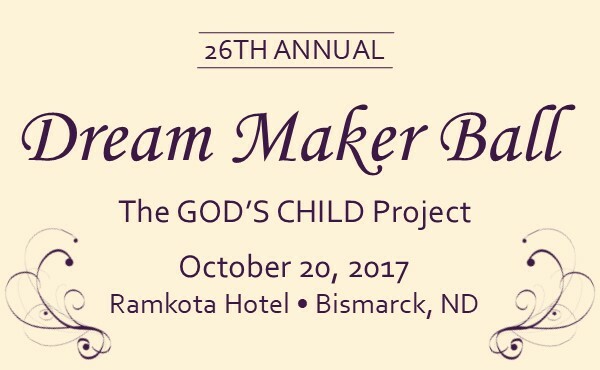 Get your tickets NOW for the 2017 Dream Maker Ball. Join us for a formal evening benefiting the children, women and programs of The GOD’S CHILD Project. Enjoy live music, dinner, dancing, silent auctions and so much more. Ladies and Gentlemen of all ages – Get dressed up, enjoy a beautiful evening and fine dining, all while supporting the children and families of The GOD’S CHILD Project. We provide food, clothing, medical care, education and shelter for 7,000 boys and girls which we could not have done without fantastic supporters like you. Call Hannah at (701) 323-0296 for more information. Friend Sponsors: American Bank Center, Beaver Pond Press, Broadway Grill and Tavern, CenturyLink, Dakota Community Bank, Marjory Atkinson and Family, and Sanford Health.